At a press conference following the Federal Communications Commission’s 3-2 vote Thursday to launch a formal rulemaking proceeding aimed at unlocking the set-top box FCC chairman Tom Wheeler emphasized, as he has since announcing the proposal last month, that nothing in the proposed new rules alter existing licensing or content-protection agreements between networks and pay-TV providers or disrupt existing advertising models. On the contrary, he said, “the rules will require that the sanctity of the content is passed through” unaltered to any new device or app used by consumers to access pay-TV content. That includes, he went on to clarify, the network’s channel position, the content recording rules and the unadorned, original ad load. 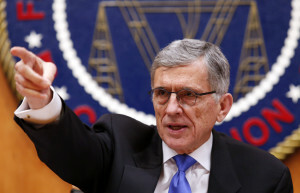 In fact, it’s not clear from his comments what, exactly, Wheeler hopes or expects anyone to be doing with the newly open standards for set-top boxes, assuming the rules ever gets that far through the likely gantlet of lawsuits and foot-dragging (the formal Notice of Proposed Rulemaking the commissioners voted on has not yet been published by the FCC). He took pains at Thursday’s hearing to make it sound as if nothing much would change about set-top boxes at all under the new rules apart from the manufacturer’s name plate, going so far as to put up a pair of identical slides purporting to show before and after schematic drawings of how consumers would access pay-TV content. Given the already ferocious blowback to proposal is getting from the pay-TV industry and rights owners, Wheeler of course has every reason to soft-pedal the degree of disruption it entails at this point. But if something meaningful does come from the rulemaking it’s unlikely to be as simple as Wheeler is making it sound. For one thing, the the market for devices (or even apps) that treat pay-TV content the same way cable boxes do today is likely to be limited, even if they does other things too, like stream Netflix and Hulu. What consumers really want is to get free of the pay-TV bundle altogether, not simply to get it on another device. Any long-term cost savings, moreover, are likely to be illusory. Buying your own box might eliminate the box rental fee from your cable bill, but most cable bills today are larded up with all sorts of other ad hoc, arbitrary fees, like the “Broadcast TV” fee and the “Regional Sports” fee on my Comcast bill. To imagine that eliminating set-top box rental fees would prevent operators from finding equally arbitrary ways to recover that lost revenue underestimates the creativity of pay-TV operators. Wheeler knows all that, of course. But he also knows that any straight up attempt to mandate the disaggregation of pay-TV content from the bundle would be a legal and political non-starter. Instead, what his proposal attempts to do, as best can be told from the outline released so far by the commission, is to carve out room in the box (or pay-TV app) for a new software layer where new functionality can be built. The real battle, then, will be over how far that new software should be allowed to go in ignoring or manipulating the terms of the current bundle. Service discovery: Information about what programming is available to the consumer, such as the channel listing and video-on-demand lineup, and what is on those channels. Entitlements: Information about what a device is allowed to do with content, such as recording. Content delivery: The video programming itself. For all Wheeler’s protestations of preserving the sanctity of the content, what the proposal would do, in essence, is turn the current pay-TV bundle into a searchable database of content, which a search algorithm could potentially find, re-aggregate and link to however it wants. The algorithm wouldn’t need to worry about what channel a program is on, or where that channel is in the lineup if it’s free to ignore the concept of a “channel” altogether and link directly to the content. Given the right inputs, software can create a virtual a la carte user experience without needing to change the underlying structure of the business. The real losers in that scenario would be the networks, not the pay-TV providers, who would still at least maintain a billing relationship with the consumer. As discussed in a previous post, the networks have invested enormous amounts of time, effort and money into building and protecting their channel brands, but all that brand equity won’t buy much in a world without channels. In effect, Wheeler’s proposal could ultimately leave TV networks in the same position on pay-TV platforms as newspapers find themselves in with respect to Google, with their content unmoored from their brands, their audiences fragmented and fleeting, and new business models being built around the reaggregation of their content without their permission. And as it has between newspapers and Google, the battle over the FCC’s set-top box proposal is likely to come down to an argument over linking, deep links and the display of excerpts, raising many of the same copyright questions as animated those earlier battles. Unfortunately for the networks, publishers in the U.S. have not had great success litigating those issues, even without the FCC putting its thumb on the other side of the legal scale. But that’s not likely to stop the networks from trying. Update: The full NPRM has now been published and can be found here.